Divorce is difficult under the best of circumstances. When your spouse has borderline personality disorder (BPD), narcissistic personality disorder (NPD), or is manipulative, divorcing can be especially complicated. While people with these tendencies may initially appear convincing and even charming to lawyers and judges, you know better—many of these "persuasive blamers" leverage false accusations, attempt to manipulate others, launch verbal and physical attacks, and do everything they can to get their way. Splitting is your legal and psychological guide to safely navigating a high-conflict divorce from an unpredictable spouse. 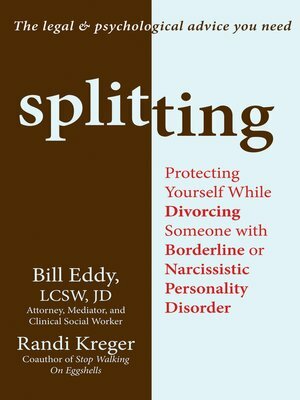 Written by Bill Eddy, a family lawyer, therapist, and divorce mediator, and Randi Kreger, coauthor of the BPD classic Stop Walking on Eggshells, this book includes all of the critical information you need to work through the process of divorce in an emotionally balanced, productive way.